Maybe this has been done before, maybe it hasn't. Too long has the right side of the box been ignored. Too long have we referred to it as the "other side" or even the "dumb side". Okay... before I start taking civil rights speeches out of context and offend someone, here's the pics of what coffee made me do tonight. The case is a Chieftec (Antec knockoff) The heater core is made for a 80's Mustang. I'm not so great with plumbing, so I'm going to pay a radiator shop $20 or so to put the ½" barbs on it for me. I removed one of the Hard drive bays to allow for a very large 220v fan that I will be running at 110v to make it absolutely silent. It will run constant. If it isnt enough, I'll put a 120mm delta on it instead. I'm sure the 170mm AC fan will do it though. I'm plannign to decap, and possibly direct die cool my aging 3800 x2 939, so getting a water case set up seems like a good idea. The heater core is a snug fit in the hole I cut, I'm thinking the shroud should be it's only attachment to keep things simple. The heater core does not block the side panel. It stops about 2-3 mm short of touching it. What do you guys think of a outdoor fountain pump for it? The little grey 525 GPH ones. Disclaimer: No beers were harmed in the cutting of this box. Last edited by Azriel; 16th April, 2008 at 10:19 AM. 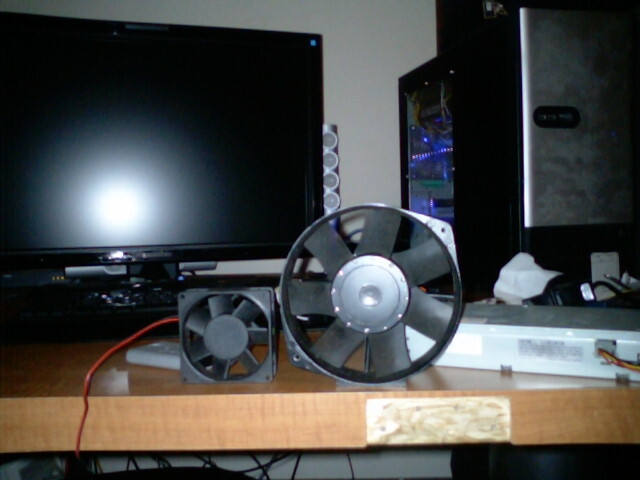 this is the AC fan, sitting next to a 80mm fan for comparison. I might not use it. it doesn't seem to put out any more air than a decent delta 120. 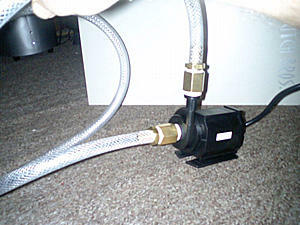 The only reason I was leaning toward AC for the fan is that I will have the AC for the fountain pump right there anyway, and it would take the load off the PSU. i may find an actual 110v AC fan to use in it's place. Last edited by Azriel; 16th April, 2008 at 12:20 PM. Hmmm... cool idea.. err.. I mean of course, I was gonna do that. My real dilema here is that my northbridge sink actually passes under the tail of my 8800 GT, making a waterblock there impossible without making it myself. For starters, I'm going to go with a Swiftech Apogee GT CPU block, and nothing else. i don't want to overdo it and get in too far over my head. Simple is good, considering this is my very first water rig. I'm not sure if i want to make this a water righ that you don't know is a water rig from the outside, or if I want to mount a giant reservoir on the outside of the box. It's something i have to decide soon though, as I would want to point 1 of the barbs straight out the side if I went with a large external reservoir. What kind of cheap reservoirs have people done? If i did a reservoir, I'd want to keep it rather simple. Last edited by Azriel; 16th April, 2008 at 01:47 PM. I wouldn't bother with the resovoir, just run a tee line at the inlet of the pump. Keep it as simple as possible to make it easy to maintain and minimize the chance of a failure that can take your rig with it. What would you guys recommend for the fluid? Just distilled water? Add alcohol? I don't want to use anything that is colored, UV reactive etc. All these things require some sort of particulate that will cause problems. I've been doing some reading, and the D-tek Fuzion block seems to be the best atm. I'm a little overwhelmed, though. I need a little help here. A shopping list and some site suggestions would be very helpful. 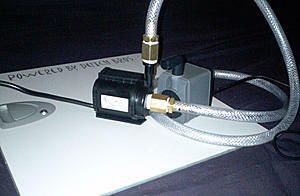 The D-tek doesn't use a backplate, and drops 2 degrees when used with the Apogee plate. Aparently the original Apogee plate was ****e and a much better one was later offered, and can be bought separately. Enough for me to make a couple small mistakes. I know I want it, and that newegg has it for a fair price, but it comes without fittings and this is an area where I am exceptionally retarded. Last edited by Azriel; 16th April, 2008 at 11:36 PM. The AC fan you're using looks to have a very large bladeless area in the middle of it which could mean you get a decent sized hotspot in the dead center of the radiator. By comparison most radiator fans are low rpm large DC units with rather small motors by comparison. Maybe angular ducting to distribute airflow better over the full unit? Distilled water and a little iodine to kill the bugs will work great. I agree with dsio. 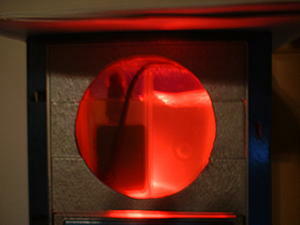 A ducted fan to clear the center hot spot. I do like a res if only for ease of bleeding the air out. They can also look pretty cool. I thought about the hot spot that 110v fan would cause, along with leaving the corners uncooled, and I had a profoundly strange idea. There would be no intake on the left side of the box. The air would enter, AND exit through the heater core. I'd to cover roughly half of the heater core with shrouded 120mm in the center, blowing out. 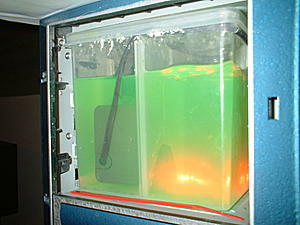 Air would pass into the box through the rest of the surface. 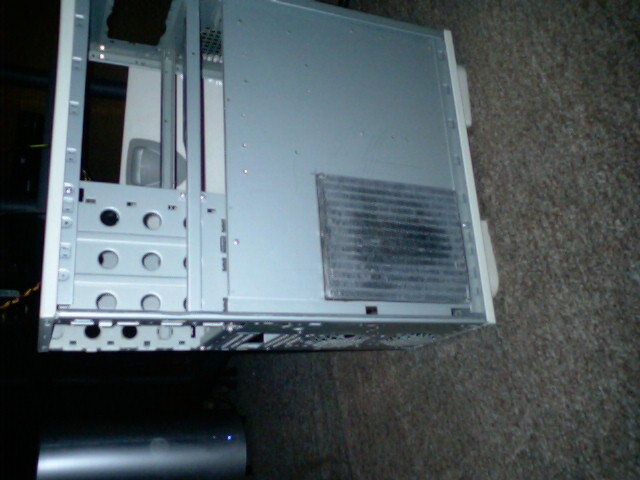 There would be a Box around the core to make the fan also actively pull the air in without increasing the case temp. Last edited by Azriel; 17th April, 2008 at 12:12 PM. Alternatively, I could put two high CFM 80mm fans in the front fan location, and just shroud the heater core and the pump in with them. Either way, I want to keep the core and the pump inside a box. If I drilled pin holes in the four corners of this area, I'd know about a leak from either before the floor of my case was full of water. I think I'm am also going to go with a simple externally mounted reservoir so a level drop will be obvious. Case cooling gets easier and more important when water cooling...Imho. 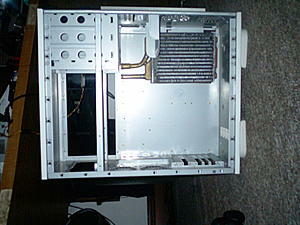 The case will still have air cooling, And I'm still going to have a fan blowing down at the cpu area for the mosfets. 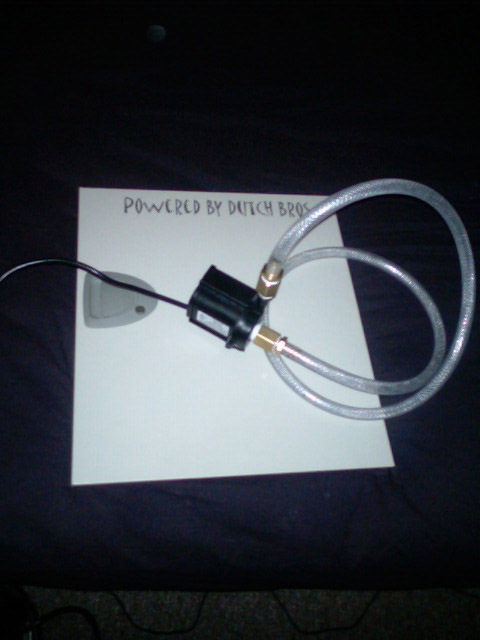 I bought a fountain pump today. It's rated 320 GPH, and it has some serious pressure. I already had a pump that claimed to be 525 gph, but this thing is a lot better. I put some fittings on it and ran a 6 foot loop. There was a little air in the line, but not much. i looked at some plastic fittings, but decided to go with brass instead. There is a little issue with it. It weeps a little from where the turbine mates to the main unit. They didn't use an O ring. I'm not sure if I should seal it up , or just put the pump in a reservoir. Am I really supposed to be using 1/2" ID tubing? This **** is the size of garden hose. My tubing is 3/4 inch outside diameter. 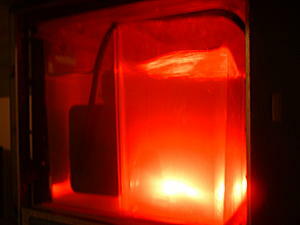 I ran my pump, pump before now, submerged for years. I really quieted things down. Those pond pumps do not dump much heat into the water. Last edited by Samuknow; 19th April, 2008 at 05:17 PM. I'm cooking up a pretty cool reservoir idea. It's going to go through the front of the case. Just enough of it will be inside the case to run the lines through the top. I'm on paper atm, but I'll start building a cardboard mock up Monday morning. When i have something I like, I'll cut the case out for it, and then reproduce it in bronze tinted quarter inch polycarbonate. I may have to break from my love of blue light, I think amber or green would look better through the bronze tint. I'm looking things over, and I'm leaning toward passive on the radiator. The PSU and the heater core both have to be exhaust. But, if I turned the two 80mm fans in the rear around and made them intake, and added 2 120mm intake fans to the left side, I should be unbalanced enough to compensate for the 120mm in the PSU and still push quite a bit of air through the heater core without actually putting a fan on it. With my reservoir low-front mounted, It can be a lot bigger if I don't have to worry about maintaining a direct air path to the heater core. I could still get a shroud and a 120mm on the heater core if I went with a side window reservoir, but i really want the look of the low front mount. Last edited by Azriel; 20th April, 2008 at 02:32 PM. Reason: as always, i kand speel. I like the idea of making the case a "fan box" so to speak. 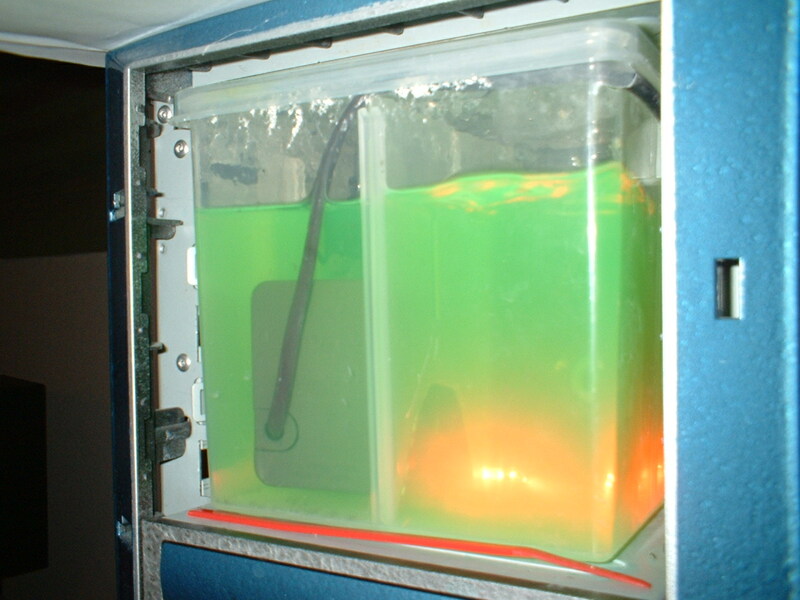 I have seen people do this with the small totes back when water cooling was just getting going. Rad in one side and fans in the other. This should work great. Those pond pumps do not dump much heat into the water. Yeah, that's basically what I've done with my Yeon Yang case, except for cooling my hard drives rather than my rad. 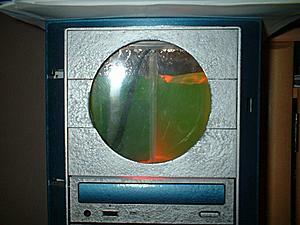 (8 seagate barracudas generate a ton of heat.) I'm actually pulling a slight vacuum in my case because of all the fans pulling air across the drives.